Data safety and accessibility remained permanent issues for the users of email clients like MS Outlook. As the time passed, email clients like Outlook evolved providing more stability and better data security. But with the evolution of cloud-based platforms like Office 365, Outlook users have better options to keep their email data safe. Consider a PST file, containing some important emails, getting corrupt due to sudden system shutdown/virus attack. So, what will be your reflex action in this condition? You would try to save the concerned PST file without letting lose any of its items. To perform Outlook PST recovery, you have two options. Either try the Microsoft inbuilt utility ‘Scanpst.exe’ or take assistance from a reliable and result-oriented third-party Outlook PST recovery tool. Rescuing corrupt PST file using ‘Scanpst.exe’ may, perhaps, help you up to some extent, but it would not support the recovery of severely damaged PST file. It will not perform precise recovery and may also, God forbid, lead your data to a much worse scenario. Therefore, you should look for a promising third-party tool like Kernel for Outlook PST Repair to repair your Outlook PST data. Also, the tool has the facility to save PST data directly to Office 365. To rescue concerned PST file it is important to make correct selection of relevant third-party tool. Since there are numerous tools available in the market with all promising features, it becomes hard for the user to make wise selection. In such case it is advised to use the most recommended third-party tool. Kernel Outlook PST Repair is the most recommended and result-oriented third-party software that provides PST file migration to cloud-based platforms for better accessibility and data security. PST conversion to different file formats is a good option. But many Outlook uses prefer saving Outlook emails to Office 365. As the name suggests, cloud-based platforms like Office 365, provide direct access to concerned PST files with no limits linked to them. The migrated PST files can be universally accessed; therefore, this feature of Kernel for Outlook PST Repair is highly praised by professionals who are currently using it. Cloud migration is safe because there is no chance that your data may get damaged or lost. Some of the reasons for moving your data to Office 365 are stated below. It reduces the risk of data loss as Office 365 is secure and safe (as there is no possibility of issues like PST corruption). The cost of maintaining and managing email clients like MS Outlook can be avoided. Office 365 offers high availability. You can quickly access emails from any location and with any device (just with internet connectivity). 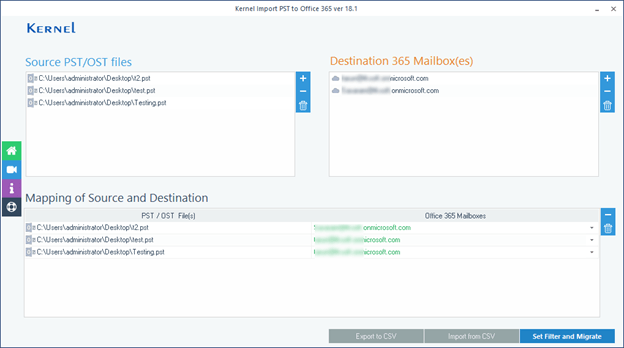 Kernel Import PST to Office 365 is a uniquely designed tool for importing healthy PST files to cloud-based Office 365 platform. This tool effortlessly imports healthy PST and OST files to Office 365. With the use of this tool, you can import PST file to Exchange server too. This import PST to Office 365 tool has filtering options by which you can select folders/items before importing PST to Office 365. Note: This tool cannot repair corrupt PST files. If your PST files are corrupt, you should use Kernel for Outlook PST Repair to restore them to Office 365. Repairs corrupt PST files Does NOT repair PST files. Requires MS Outlook to save PST data Does NOT require MS Outlook to import PST data. Can save damaged PST files to Office 365. Can only import healthy PST files to Office 365. 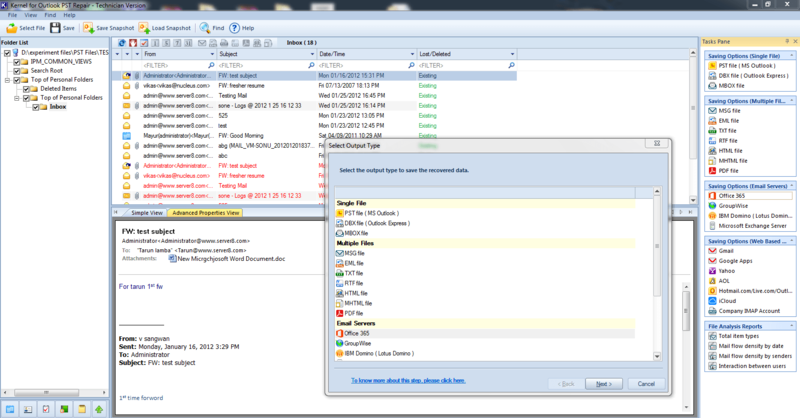 Has multiple file saving options – email servers (like Exchange), webmails (like Gmail), MBOX, DBX, and more. Only imports to Office 365, Exchange (hosted/on-premises).